This is continuation of the first part of my Jomsom to Muktinath Trekking Tale. In case you missed the previous post let me summarize it for you. 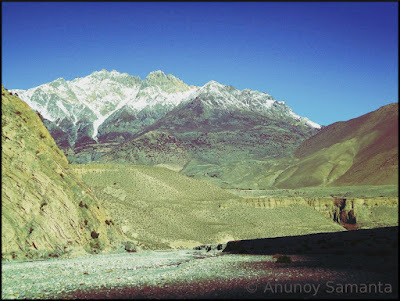 In October, 2011, I along with two of my friends, responded to the call of mystic Mustang. This ‘Mustang’ is neither the iconic motor variant of Ford nor a dark golden mare from a cowboy movie. 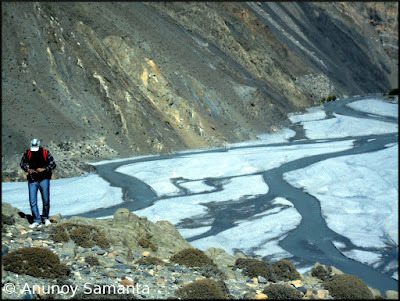 It is, in fact,one of Nepal’s most extravagantly beautiful and dangerous landscapes, destined only for the fortunate few who dare to abandon their luxury couch and taste the raw barrenness of Tibetan plateau over 3000 meters from mean sea level. This is risky beauty, and you’re prepared for almost anything as you sit inside a passenger packed 4WD, crawling on narrow-bumpy curves, between ‘anytime ready to slide’ rocks and the deepest ravine in the world. 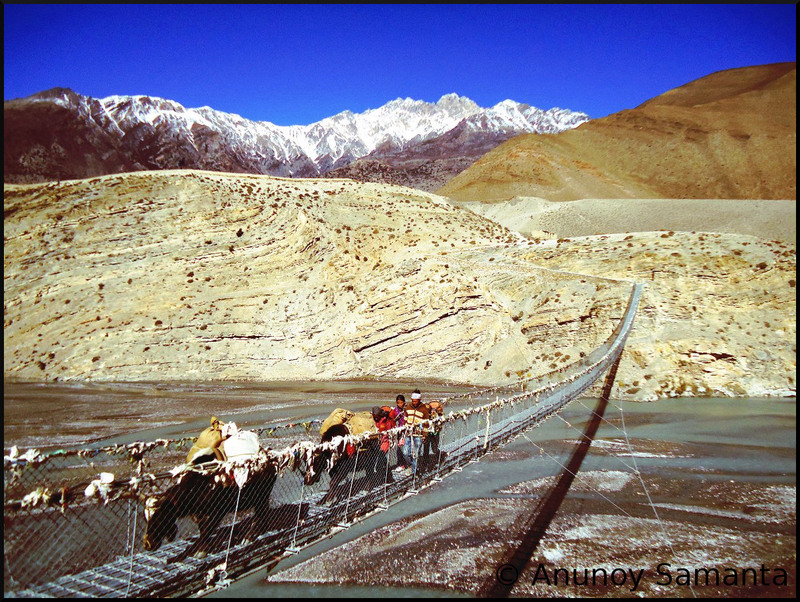 You could take the 30-minute exhilarating air route from Pokhara to Jomsom, the district headquarter of Mustang, or do the day-long road journey that covers some rare vistas formed by the snow-white Annapurna, infinite waterfalls, changing patterns of vegetation, magical rays on snowy peaks and the roaring Kaligandaki. Raw barrenness of Tibetan plateau over 3000 meters from mean sea level. We chose the second option, but wait—there’s a third option, only for those brave-hearts who’re traveling with time in their rucksack. You can trek all the way from Nayapul—a nearly two-hour bus ride from Pokhara to Jomsom to get intimate with the spectacular terrain in a more sensual way.We remained engrossed in the live documentary before us, silently watching our vehicle crossing shallow tributaries, charismatic setting sun, fading frozen summits, apple gardens of Marpha village and finally reaching the town of Jomsom, which looked mysterious in its late-evening cloak of darkness. A home-stay with a big board that read ‘Hotel Jomsom Paradise’ welcomed us and soon we succumbed to the warmth of the wooden room and quilt after enjoying tea, bread jam and chilly fried rice. My quick recap of the first day ends here. 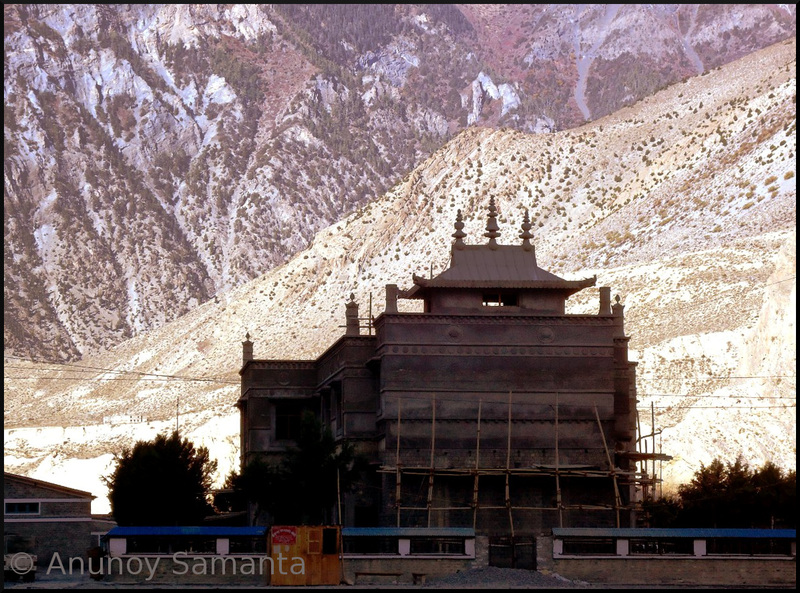 The town of Jomsom looked mysterious in its late-evening cloak of darkness. Our first morning at Jomsom (Day 2) turned out to be cursed by cold northern wind. It was difficult to stand even for a minute on the terrace to observe the picturesque barren rocky mountains and snowy peaks all around us. The early rays of sun giving a prismatic effect over snow was something so alluring but then I realized that I couldn’t afford to lose my battery level as a whole day trek was just waiting for us in the coming hour. 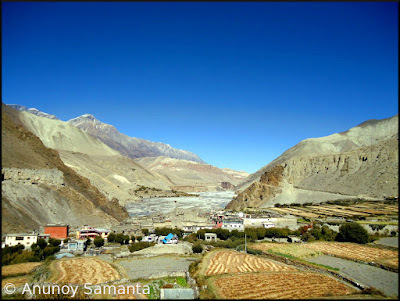 Momentarily I bid an adieu to the quivering colored flags and orange stacks of ‘to be dried’ corns on surrounding flat wood piled rooftops and got ready for Muktinath trek in ice cold water of the taps. After reaching the jeep-stand we finally decided to trek uphill for Muktinath. Our first morning at Jomsom turned out to be cursed by cold northern wind. We were almost in tight denims (make it a point to wear some loose trouser while trekking), without any trekking shoe (sport shoes are really not capable when it comes to trekking), had no trekking sticks (they come real handy in steep ascents) and had enough luggage (most of which I had taken care of in my backpack) to fight against gravity!... and most importantly we commenced our trek not before 9 AM but with an objective of climbing an altitude of more than 1000 meters, completely unaware of the fact how dusty wind transforms to crusaders over the rocky cliffs after 12 noon! 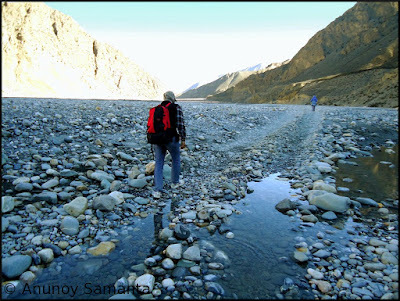 Make it a point to wear some loose trouser while trekking, not tight denims like us. 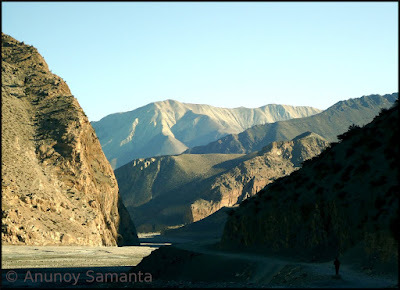 On the way we kept taking photographs of the reflecting mountaintops, crossed the calmed down shallow pebbly Kali Gandaki river and greeted joyfully to the fellow trekkers returning from Muktinath. Approximately in an hour or so we reached a village named Eklebhatti and purchased some energy drinks in a trekkers’ inn. There was no much ascent till then, so we were fully charged and restarted our power trekking after a five minutes break. Things were changing without our knowledge as we started munching heights. We had some dry fruits and biscuits from our stock while watching a village family crossing a long hanging bridge while carrying tons of loads on their back. It was amazing to watch how easily a short stature woman carries a gas cylinder up the hill on her back without slightest sign of irritation in her face!... and yea they speak clear English too! After Kagbeni the steep ascent began and it had past 12 noon! I felt the urgency of using toilet as we reached Kagbeni in another hour, having lost our initial speed. Seeing the board ‘Dragon hotel restaurant & bar’ with a decent structure we went in. A picturesque village was posing itself down the valley which was visible quite nicely from the veranda of the restaurant. Having freshened up with energy drinks we resumed. But after Kagbeni the steep ascent began and it had past 12 noon. The sun overhead, dry-dusty northern wind was dehydrating us faster than we could anticipate and lack of trekking gears did the rest of the job of draining out our spirit. After sometime we found our water bottles empty... luckily a group of trekkers coming downhill generously helped us with their water supply! The sun overhead, dry-dusty northern wind was dehydrating us faster than we could anticipate. As the clock advanced I started feeling the heaviness of my backpack and hollowness of my sport-shoe. Almost same condition struck Dr Yoho, my co-traveler. Gradually I understood that I was under the hex of Acute mountain sickness (AMS). 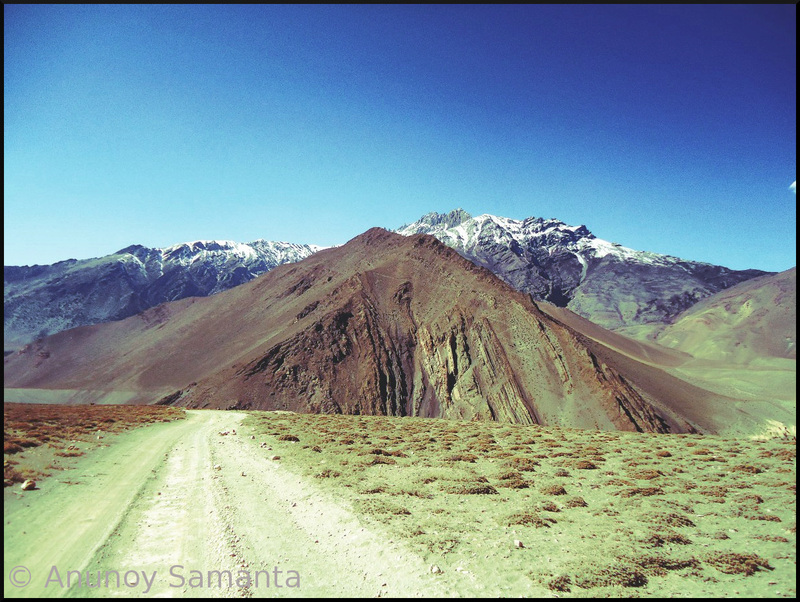 AMS is a sickness that affects travelers at altitude above 2400 meters characterized by light headedness, fatigue, headache, loss of appetite, nausea, rapid heart rate, shortness of breath with exertion, sleeping difficulty etc. The faster one climbs to a high altitude, the more likely he’ll get AMS! Symptoms depend on the speed of climb and how hard the climber exerts himself. Gradually I started feeling the heaviness of my backpack and hollowness of my sport-shoe! AMS is due to a combination of reduced air pressure and lower oxygen levels at high altitudes. To prevent AMS it is recommended to ascend slow may be 300-500 meters/day, not to exert oneself, eat high carbohydrate foods, take plenty of fluids, avoid alcohol and caffeine. Once you’re affected by AMS primary measure is to stay at the same height for 1-3 days as a measure of acclimatisation or if possible descend, take Acetazolamide tablet 250mg 12 hourly after consulting with a doctor. Things were changing without our knowledge as we started munching heights. It had past 3 afternoon and we were still 2-3 kilometers away from our destination when we aborted our trek and reserved a passing by jeep (we were really lucky to get one!) for the remaining bit of our journey. 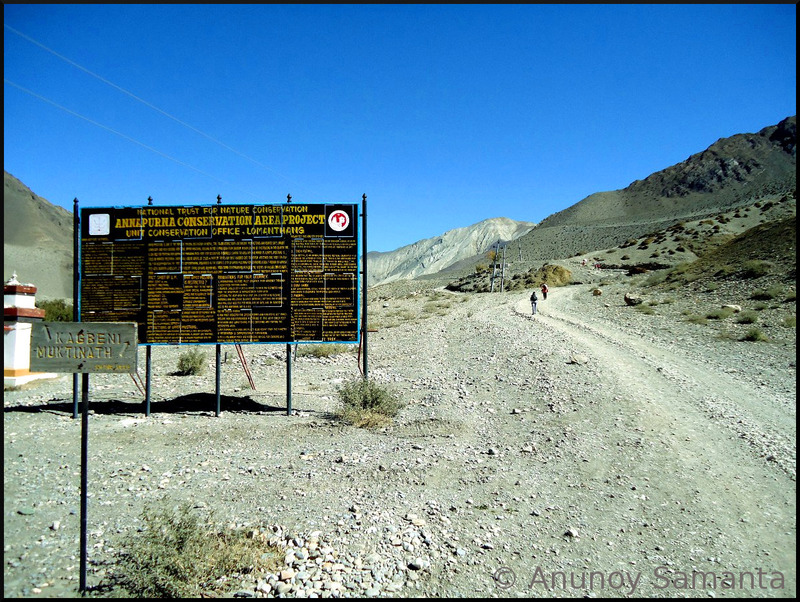 In 10 minutes the jeep jumped up and down quite a few times to drop us at Muktinath before it was 4:00 PM. We (except Dr. Ridmi, who was even fit for completing the trek) didn’t have any fuel left in us to search for a good lodge. Consequently, we crawled into one trekkers' lodge which was just adjacent to the jeep-stand, with our baggages and altitude stuck health. It had past 3 afternoon and we were still 2-3 kilometers away from our destination! Getting hot water was a fancy there too, so I kept on tossing on bed with dust coated skin, light head and ‘120 plus’ heart rate for the next twelve hours while Yoho suffered from tightness of chest and clattering teeth (due to hypothermia). From inside our log cabin we could hear the local people celebrating Diwali tihar (festival) with traditional songs and music... quite a marvelous experience eh? A group of mountain bikers negotiating the slope while my vision was as hazy as this shot! Click here to read the Final Part of my Jomsom to Muktinath Trekking Tale. Indeed, it was a fine crafted travel tale. Good one. 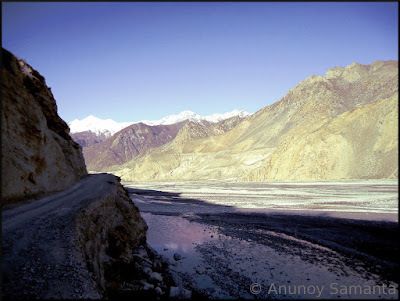 Some places are deadliest but spellbindingly beautiful.There is a tremendous bounty of dangerous beauty in nature. As the indigenous mountain individuals for the most part take after their own particular extraordinary type of Buddhism, cool training the Khumbu is ornamented with numerous chortens, Gumbas, little stupas, religious communities, petition banners and Mani stone divider carvings.